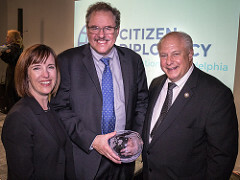 In support of Philadelphia’s place as a national leader in democracy and justice, Citizen Diplomacy honors Robert A. Swift, a pioneer in human rights litigation, for his groundbreaking work in pursuit of justice for human rights victims around the world. For more than 30 years, Swift has worked to secure justice for victims of human rights abuses, including people murdered during the Holocaust; people tortured and disappeared by former president of the Philippines, Ferdinand E. Marcos; and Korean forced laborers from World War II. He has been recognized by his peers on numerous occasions both locally and nationally. 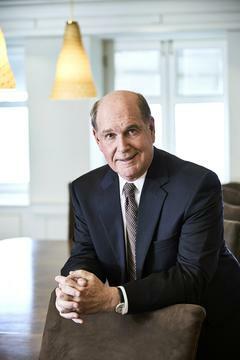 In 1995, the National Law Journal named him one of the 10 best trial attorneys in the United States and in 2013, the University of Denver's Law School presented him with a prestigious human rights awards for his achievements in human rights jurisprudence. He has also served on the boards of Haverford College and Arthur Ashe Youth Tennis and Education. You can read more about his passionate career here and his own writings on the groundbreaking 1986 case against Marcos here. Philadelphia welcomes over 1,200 international exchange visitors each year. Democracy and human rights justice are two of our most popular programs. 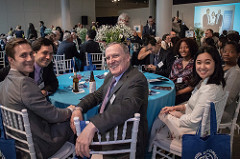 2019 is Citizen Diplomacy’s 65th year and along with honoring Robert Swift, we are highlighting Philadelphia’s place as a national leader for democratic ideals, rule of law and free press. The tax-deductible portion is equal to $4,000. 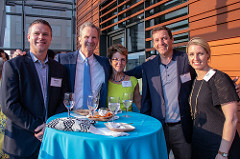 Sponsor benefits includes : 10 VIP tickets at your private table; Print Recognition: Invitation listing, Logo & listing on-site event signage; Half-page, full-color recognition in program book; Digital Recognition: Listing in email blasts leading up to the event. The tax-deductible portion is equal to $2,000. Sponsor benefits includes: 6 VIP tickets; Print Recognition: Logo & listing on-site event signage; 1/2 page recognition and listing in program book; Digital Recognition: Listing in email blasts leading up to the event. The tax-deductible portion is equal to $900. Dimensions are 5.1" W x 3.95" H. Art should be supplied 1:1 at 300dpi. Supported graphic formats: .png, .eps, .tif, .pdf, .jpg. 100% of your gift is tax-deductible. The tax-deductible portion is equal to $300. The tax-deductible portion is equal to $150. The tax-deductible portion of each ticket is equal to $50. The tax-deductible portion is equal to $75 per ticket. 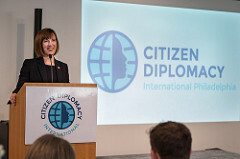 Citizen Diplomacy International is the Philadelphia region's premier international relations organization. 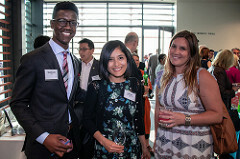 We work in partnership with the U.S. Department of State and the City of Philadelphia to make friends for our country and region, and to connect our region's institutions and people to others around the world. A copy of Citizen Diplomacy's official nonprofit registration and financial information may be obtained from the Pennsylvania Department of State, by calling, within Pennsylvania, 1-800-732-0999. Registration does not imply endorsement. Kohn Swift and Graf, P.C. 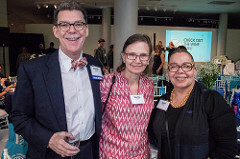 Deadline for Sponsorships and ads to be included in the event invitation is 3/31/2019. Deadline for inclusion in the event Program 5/15/2019.